Sunspot numbers track periods of sunspot activity. A sunspot is an area of high magnetic activity, on the surface of the Sun. Sunspots produce bright light, but not as much as the surface around them, so they appear dark by comparison. They are cooler than the rest of the sun. Some are small, and some are ten times bigger than Earth. A sunspot cycle of eleven years has been found, with changes in activity. Every 11 years the number of sunspots increases, and later declines. Sunspots on one cycle are magnetically different from the next, so the total sunspot cycle is 22 years. This cycle has been seen since the 18th century. Before that time, for over a hundred years, there were very few sunspots. Astronomers do not know what caused this "Maunder Minimum". 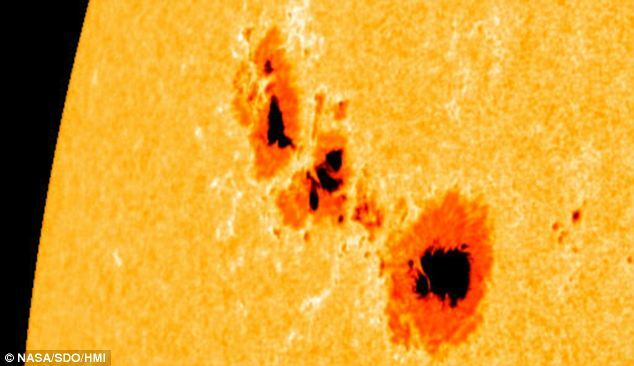 Chinese astronomers said they could see sunspots. 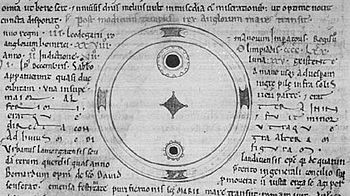 On 17 March 802 the monk Adelmus saw a big sunspot, which he could see for eight days. Adelmus thought that Mercury was going in front of the Sun and making a black spot. However, they did not really know what sunspots were until Galileo Galilei in 1612. Sunspots were important when people wondered if the Sun rotated, because they could see that sunspots changed. The first cyclic changes of sunspots was seen by Heinrich Schwabe, and made Rudolf Wolf study them carefully, starting in 1848. Also in 1848, Joseph Henry showed a picture of the Sun and made sure that sunspots were cooler than the rest of the Sun (they are about 7000 degrees Fahrenheit, 4000 C). They are still very hot, but much cooler than the rest of the Sun's surface. Sunspots are cooler than the rest of the Sun, but many scientists think that when there are a lot of sunspots, the Sun actually gets hotter. This affects the weather here on Earth, and also radio reception. Without sunspots the Earth would probably be cooler. In the same way, if there were too many sunspots, the Earth would get really hot, and there would be less rain. This would make more droughts on the Earth. Droughts are a long time with no rain. When it does not rain, the plants die: when the plants die, many animals die too. People need rain to live. The food we eat cannot grow without a lot of rain. A drought can be a very dangerous thing. The sunspots help keep Earth the right temperature. Scientists study sunspots and other solar phenomena, so they can know what they do to Earth. The temperature of a sunspot is 4780°K. This is cold when compared to other areas on the surface of sun. A view of the coronal structure above a different sunspot seen in October 2010. Sunspot 923 at sunset and in solar scope. Sunset superior mirage of sunspot #930. Tracking sunspots from Mars (animation; 8 July 2015). Sunspot Facts for Kids. Kiddle Encyclopedia.